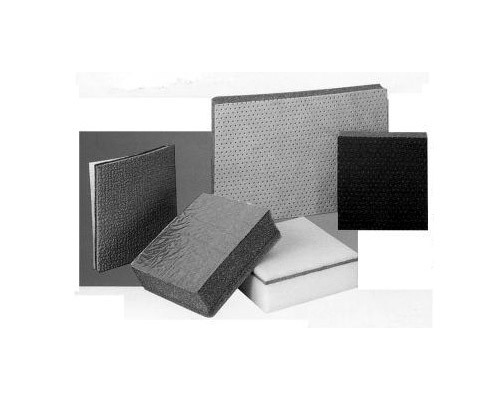 Depending upon the application, the SonoCon acoustical foams and foam barrier composites are offered with protective facings which prevent contamination from the immediate environment. Selection of the facings range from thin polyethylene films to rugged plastic or vinyl surfaces suitable for sound isolating floor mats or tractor or truck headliners to perforated wear surfaces to aluminized membranes. Panels can be attached using conventional compatible adhesives or pressure sensitive adhesives though mechanical fasteners are recommended for larger panels. Since most applications are unique, please contact PHOENIX-E for assistance is selecting a particular foam-barrier system. Sound transmission class ratings range from STC 20 to STC 26.depending upon the weight of the barrier. 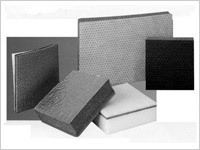 Noise reduction coefficient ratings range from 0.31 to 0.90 depending upon the foam thickness. Acoustically treat sheet metal equipment enclosures. Isolate decks and other walking surfaces from noise below. Isolate truck cabs from engine and road noise.